Alex Parker, sitting on the other side of the “soundproof” glass between the newsroom and the WKXA studio needed the warning. 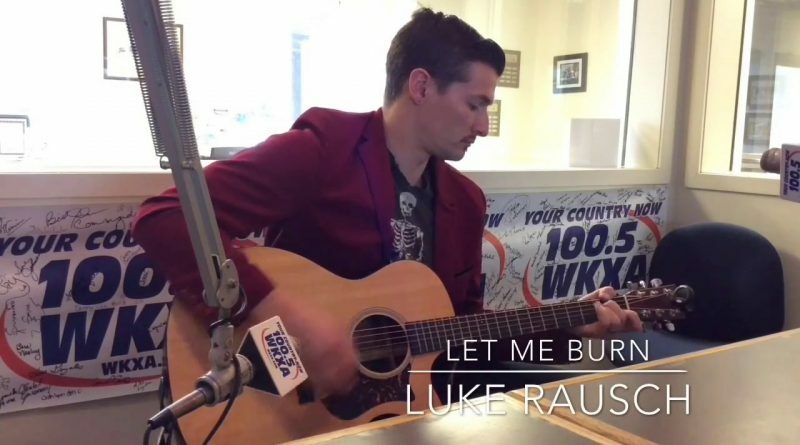 Luke tore through a passionate and yes, intense, version of “Let Me Burn” from the latest set of songs he’s written with a ferocity that, had Alex not heeded the warning, would likely have found its way onto the WFIN afternoon newscast. We got to k now Luke several years ago when he was playing guitar and singing backup in a local band, and what was striking about him was his level of humility. The world of performers is not necessarily stacked full of talented people who are as approachable and appreciative of success as Luke Rausch, so they tend to stand out. Luke grew up locally, went to Cory-Rawson High School, and found his musical inspiration in a variety of places, including Garth Brooks and Metallica, but he finds himself gravitating toward a more traditional country sound these days. “More power to artists like Florida Georgia Line and Sam Hunt for being able to do what they do and be successful at it, but I’d like to see things swing more toward what guys like Sturgill Simpson and Chris Stapleton are doing,” said Rausch. For 2017, Luke Rausch is busy assembling a full band to work with, and he just returned from Nashville, where he recorded a set of 5 songs that you’ll be hearing throughout February as we shine our local artist spotlight on him. More about Luke and his music can be found on his social media channels, which are linked below. For Luke Rausch, music is not just hobby but a passion and way of life. Being a musician isn’t just about tattoos and good looks, it’s about writing original lyrics that people can relate to, and adding music to those words to create a seamless feeling that touches people’s hearts. Luke’s uniquely smooth baritone voice can go from deep and soothing to intense gravel, which makes for a flawless lyrical storytelling night for his audience. Luke’s musical background spans a wide variety of genres, from growing up listening to The Beach Boys cassettes, to a 90’s kid with rock staples such as Metallica, to finding his country roots with Garth Brooks and too many other country greats to list. Luke’s classicly edgy style makes him a perfect fit for any setting. From a full stage of musicians to stripped down with just him and an acoustic guitar, Luke appeals to a wide variety of listeners and he brings with him a wide variety of music. Stage presence and confidence are unmeasurable for Luke Rausch, whether it’s country rock like Eric Church, or bluesy crooning of Chris Stapleton, or even learning a request on the fly for an eager fan, Luke can keep his fans on their feet and coming back for more.